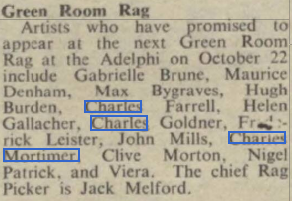 The Stage - 26 October, 1950. Green Room Rag at the Adelphi Theatre, London. The play took place on 22 October, 1950, and was a charity production. "....but the same author's "Yang-Hi Treaty" about an actor reading a part, was highly amusing, with Charles Mortimer, and Jack Melford in the cast."